Discovering Patricia MacLachlan is finding an author I can trust to be honest, uplifting, and offer children substance in each children’s book she writes. 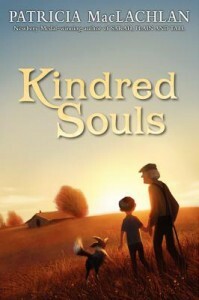 In Kindred Souls, once again MacLachlan addresses the journey of a young child dealing with the death of an elder. In this children’s book, she also offers humor, compassion, as well as a lovely magical element around a dog who just happens to show up at the same time. It astounds me, as I read book after book, what a difference it makes to find a children’s book that is well-written and honestly sensitive to the variety of emotions that a child might have. In addition, most of MacLachlan’s books are written in simple language, making them accessible to emerging readers. In Kindred Souls, an 8-year-old reader could easily take this on their own. However, since it does deal with the passing of a grandfather, it would be lovely for a parent to read this to or alongside a younger child. This children’s book is elegant, simple, and well-worth having on hand for that time in your child’s life when they go through a similar life experience.